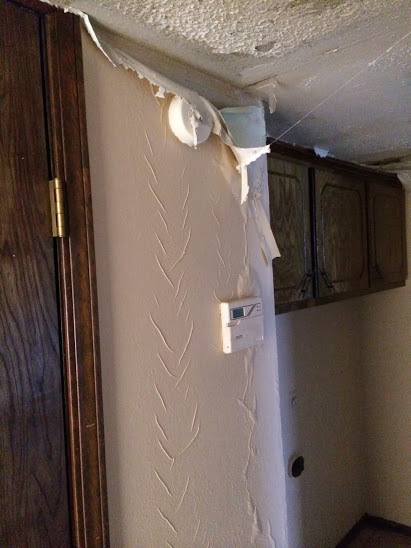 Water Damage Prevention – A-Team Carpet Clean Inc.
Did you know that water damage is among the top 3 reasons that homeowners in Lawton, Oklahoma file an insurance claim year after year? Reduce the risk of incurring water damage in your home this winter with these water damage prevention tips. 3 feet of water damage here! Mold & mildew form very quickly! Bathrooms – When the temperature falls below freezing, keep bathroom cabinet doors open and leave hot and cold faucets at a steady low stream. These tips are good for all faucets within your home. Outside faucets – Protect outside faucets with an insulated cover. Try not to use outside faucets during the winter. This helps reduce the risk of frozen pipes. If you have a crawlspace under your home, be sure to close vents and ensure pipes are properly insulated during the winter. Pipes in the attic are prone to freezing. Hot water tanks – The average life expectancy of a water heater is 8-12 years, dependent on many different factors. Tanks that are never drained tend to leak earlier. Click here for more tips from Lowe’s about when to replace a water heater. Attic plumbing – Attic pipes are more prone to freeze. This can cause a major flood in your home. If your plumbing is in the attic, it needs to be properly insulated in order to prevent freezing and bursting. So you tried our water damage prevention tips but the elements had another idea? Sometimes the best preventative methods cannot stop a catastrophe from happening. If a flood occurs in your home or business, immediately call a professional cleaning company to perform proper water extraction services. Don’t try to clean up the water damage on your own; mold and bacteria can form in your carpets and walls within hours. Only professional cleaning equipment can safely and completely remove water damage in your home. A Team Carpet Clean offers 24/7 emergency water extraction services to residents and businesses in Lawton, Oklahoma and surrounding areas of Comanche County. Emergency water extraction services available 24/7 in Lawton, Oklahoma! Next post: Is Carpet Protector Really Needed? True! This makes us struggle during winter. Might as well follow some of your tips that are new to me. Thanks! You’re welcome! So glad we could help you out with some new tips. Great post thanks for sharing these useful information. You’re welcome, thanks for the great feedback!